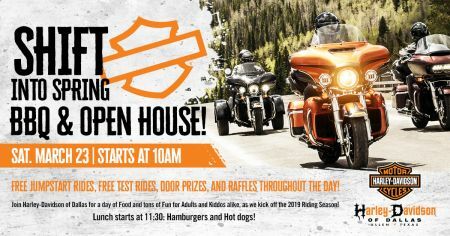 Join Harley-Davidson of Dallas in Allen Texas for a day of food and tons of Fun for adults and kiddos alike, as we kick off the 2019 Riding Season! Be here March 23, 2019 from 11 a.m. to 3 p.m.
Free Jumpstart Rides, Free Test Rides, Door Prizes, and Raffles throughout the day. Lunch starts at 11:30: Join us for hamburgers and hot dogs at our spring Harley-Davidson® riding event.